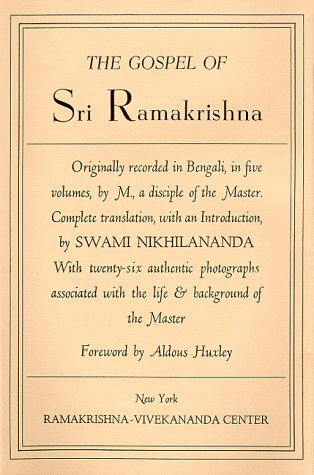 Today I was reading Sri Sri Ramakrishna Kathamrita (Discourse of Ramakrishna) which is translated as "The Gospel of Sri Ramakrishna," a collection of fluid discourses of the remarkable mystic and saint of Bengal Sri Ramakrishna (1836-1886). The transmission of this apparently simple man never cease to amaze me. He used to use very simple parables of every day life of Bengal of his time and yet would transmit the highest level of knowledge about God, a quality only found in great Messengers and Apostles like Jesus Christ and others. About the Gospel Aldous Huxley in his forward wrote, "What a scholastic philosopher would call the "accidents" of Ramakrishna's life were intensely Hindu and therefore, so far as we in the West are concerned, unfamiliar and hard to understand; its "essence", however, was intensely mystical and therefore universal. 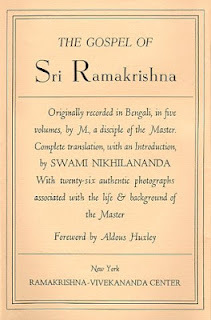 To read through these conversations in which mystical doctrine alternates with an unfamiliar kind of humour, and where discussions of the oddest aspects of Hindu mythology give place to the most profound and subtle utterances about the nature of Ultimate Reality, is in itself a liberal, education in humility, tolerance and suspense of judgment." Today the chapter I was drawn was when Sri Ramakrishna wanted to visit Pundit Ishwar Chanra Vidyasagar (1820-1891) who was a great scholar, educator, social reformer, philanthropist and writer of Bengal at that time. At that important meeting of two enlightened human beings, Sri Ramakrishna discoursed spontaneously on the Nature of Brahman (Divinity), Problem of Evil and most importantly why in this particular age of ours the identification of "Soham: I am That" is not right. MASTER: "Brahman is beyond vidyā and avidyā, knowledge and ignorance. It is beyond maya, the illusion of duality. "One man may read the Bhagavata (Holy Scripture) by the light of a lamp, and another may commit a forgery by that very light; but the lamp is unaffected. The sun sheds its light on the wicked as well as on the virtuous. "You may ask, 'How, then, can one explain misery and sin and unhappiness?' The answer is that these apply only to the jiva (sentient beings). Brahman is unaffected by them. There is poison in a snake; but though others may die if bitten by it, the snake itself is not affected by the poison. "Men often think they have understood Brahman fully. Once an ant went to a hill of sugar. One grain filled its stomach. Taking another grain in its mouth it started homeward. On its way it thought, 'Next time I shall carry home the whole hill.' That is the way shallow minds think. They don't know that Brahman is beyond one's words and thought. However great a man may be, how much can he know of Brahman? Sukadeva and sages like him may have been big ants; but even they could carry at the utmost eight or ten grains of sugar! "As for what has been said in the Vedas and the Puranas, do you know what it is like? Suppose a man has seen the ocean, and somebody asks him, 'Well, what is the ocean like?' The first man opens his mouth as wide as he can and says: 'What a sight! What tremendous waves and sounds!' The description of Brahman in the sacred books is like that. It is said in the Vedas that Brahman is of the nature of Bliss - It is Satchidananda (Unending Bliss). "In samādhi (deep absorption in God-consciousness while in this very world, in human body) one attains the Knowledge of Brahman - one realizes Brahman. In that state reasoning stops altogether, and man becomes mute. He has no power to describe the nature of Brahman. "Once a salt doll went to measure the depth of the ocean. It wanted to tell others how deep the water was. But this it could never do, for no sooner did it get into the water than it melted. Now who was there to report the ocean's depth?" A DEVOTEE: "Suppose a man has obtained the Knowledge of Brahman in samādhi. Doesn't he speak any more?" 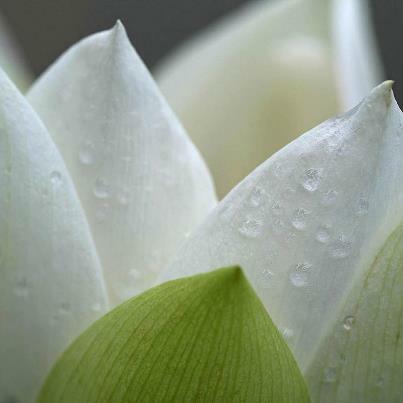 MASTER: "Sankaracharya retained the 'ego of Knowledge' in order to teach others. After the vision of Brahman a man becomes silent. He reasons about It as long as he has not realized It. If you heat butter in a pan on the stove, it makes a sizzling sound as long as the water it contains has not dried up. But when no trace of water is left the clarified butter makes no sound. If you put an uncooked cake of flour in that butter it sizzles again. But after the cake is cooked all sound stops. Just so, a man established in samādhi comes down to the relative plane of consciousness in order to teach others, and then he talks about God. "The bee buzzes as long as it is not sitting on a flower. It becomes silent when it begins to sip the honey. But sometimes, intoxicated with the honey, it buzzes again. "An empty pitcher makes a gurgling sound when it is dipped in water. When it fills up it becomes silent. (All laugh.) But if the water is poured from it into another pitcher, then you will hear the sound again. "The rishis of old attained the Knowledge of Brahman. One cannot have this so long as there is the slightest trace of worldliness. How hard the rishis laboured! Early in the morning they would go away from the hermitage, and would spend the whole day in solitude, meditating on Brahman. At night they would return to the hermitage and eat a little fruit or roots. They kept their minds aloof from the objects of sight, hearing, touch, and other things of a worldly nature. Only thus did they realize Brahman as their own inner consciousness. "But in the Kaliyuga, man, being totally dependent on food for life, cannot altogether shake off the idea that he is the body. In this state of mind it is not proper for him to say, 'Soham: I am He.' When a man does all sorts of worldly things, he should not say, 'I am Brahman.' Those who cannot give up attachment to worldly things, and who find no means to shake off the feeling of 'I', should rather cherish the idea 'I am God's servant; I am His devotee.' One can also realize God by following the path of devotion. "The jnani (seeker) gives up his identification with worldly things, discriminating, 'Not this, not this'. Only then can he realize Brahman. It is like reaching the roof of a house by leaving the steps behind, one by one. But the vijnāni (knower of deep knowledge), who is more intimately acquainted with Brahman, realizes something more. He realizes that the steps are made of the same materials as the roof: bricks, lime, and brick-dust. That which is realized intuitively as Brahman, through the eliminating process of 'Not this, not this', is then found to have become the universe and all its living beings. The vijnāni sees that the Reality which is nirguna (Dzaat in Sufi term), without attributes, is also saguna, with attributes (Sifat in Sufi term). "A man cannot live on the roof a long time. He comes down again. Those who realize Brahman in samādhi come down also and find that it is Brahman that has become the universe and its living beings. In the musical scale there are the notes sa, re ga, ma, pa, dha, and ni; but one cannot keep one's voice on 'ni' a long time. The ego does not vanish altogether. The man coming down from samādhi perceives that it is Brahman that has become the ego, the universe, and all living beings. This is known as vijnāna. "The vijnāni sees that Brahman is immovable and actionless, like Mount Sumeru. This universe consists of the three gunas - sattva, rajas, and tamas. They are in Brahman. But Brahman is unattached (independent of the any and everything)." Many Hindu schools until this time still encourage the disciples to practice the meditation of "Soham" which literally means, "I am That," which is a mystical statement of the Universal Truth. But as Sri Ramakrishna points out, in this age when mind is entangled with the sense of "I" and external senses and also runs after the thoughts of money, world and material things, "Soham" or "I am That" is not right seed to enlightenment. Rather for such age, "I am the servant of God," "I am the instrument of the Supreme," or at best, "I am the representative (khalifa) of the Most Supreme," is more close to truth for the general state of consciousness of humanity of this age. Thus Venerable Prophet Muhammad, salutation of peace and divine blessings to his soul recommended the name AbdAllah (also written as Abdullah) which means Servant of Allah. The feminine counterpart of this name is Amatullah.